In today’s world, customers expect 24/7 service and support across multiple channels and platforms. This means that organizations need to become more digitally-focused and interact with customers in real-time via social media, chat, and mobile devices. Digital transformation can help organizations improve a number of metrics including customer lifetime value, net promotor score, agent satisfaction, and revenue. 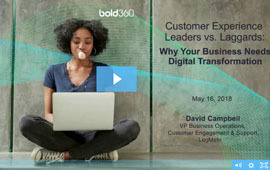 In this Argyle Executive Forum, in partnership with Bold360 by LogMeIn, we explore how organizations can leverage multiple digital channels and new technologies to improve the customer experience and how to implement an enterprise-wide focus on digital transformation.